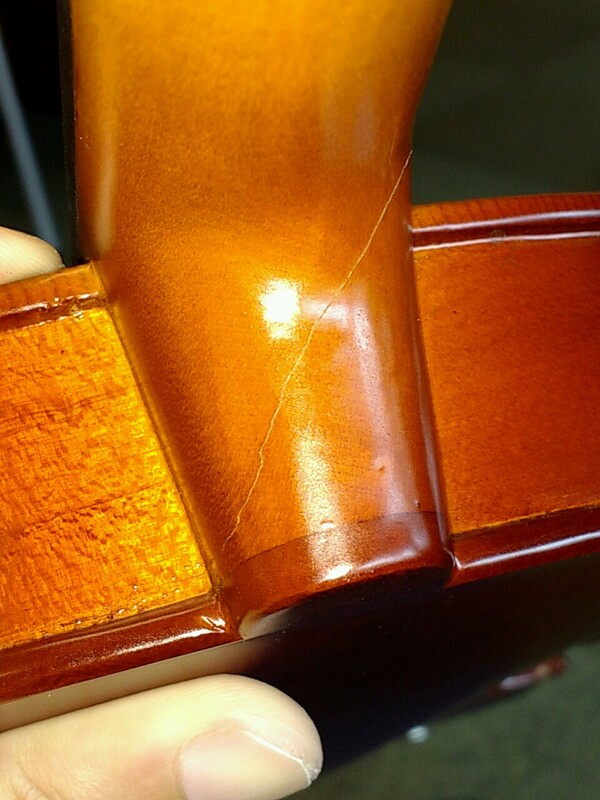 Cracks in brand new violin- normal? I recently bought a brand new student violin (Raggetti RV2), only to bring it home and look like it's been cracked and repaired. I just thought I'd put up some pics to seek advice. Though Australia has good warranty/return laws, I'm not sure if the store would respond to a refund/replacement request. I've already called them; it's a store that focuses on electrics/drums staffed by macho blokes, and they've been quite condescending. I've put up some pics: I would be greatly obliged if I could have your views on what I'd need to do if the store doesn't replace. If it were me, I would definitely arrange for a return. 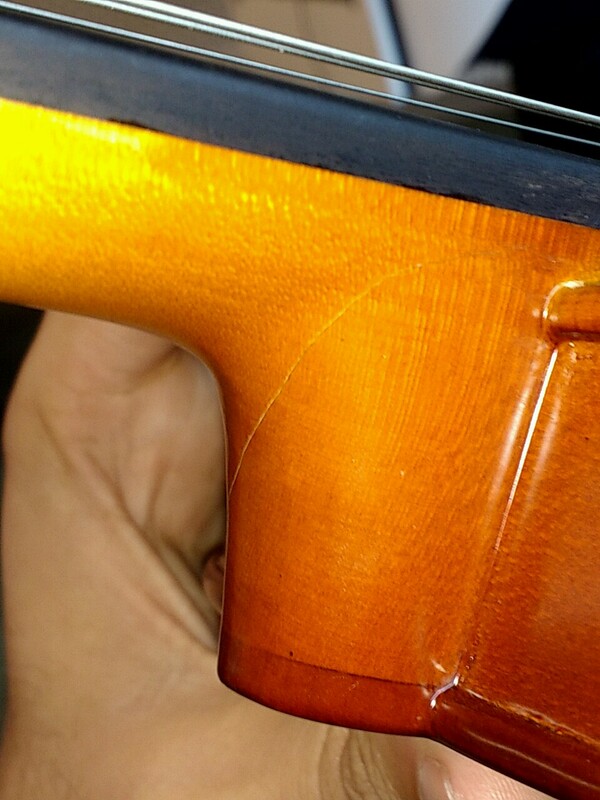 Aside from the fact that a brand new violin shouldn't have such an obvious flaw, the neck is not a good place for a crack, and if you don't know the expertise of the person who repaired it, it's a crapshoot wherher or not that repair will hold. Thanks. I'll take it in to the shop tomorrow, but I'm almost sure to be given a BS excuse (normal join, not a defect, that's how violins are, "mate") or worse be lied to that that's not how the item was at time of purchase. (Kinda know what behaviour to expect). How do I counter? It's definitely a repaired crack, I take it? No, that is not a normal join. If it's not an actual crack then it might just be a big scratch in the varnish. But either way, I'd think that you were entitled to receive a pristine instrument. Hmmmm... well yes, indeed. I would not be happy with that. Like @pj1968 above - hard to tell immediately if it is an actual crack ( I'm not sure if it is or not - it doesn't seem to follow the grain of the wood - but - that means nothing ), or "just" a cosmetic blemish ( scratch ). If it IS a crack, I kind of suspect it has not been repaired - by the way the "crack line" tails off - so if it is a crack, it looks like it is still cracked, and not repaired. However, either way, I would "stand-your-ground" and demand either a replacement or full refund. Stand up for your consumer rights, and don't be put-off by the "macho blokes" at the store ! (They may treat their drum kits like that - but you should expect a new instrument to be in new, out-of-box condition - that quite clearly is not). Print out these responses and go back to the store, and as I say, stand-your-ground. I have no idea what your consumer rights in Australia are - but - if they refuse to honor your request - at the very least you can name and shame them, and ultimately, if necessary, use your equivalent of our ( UK ) ombudsman service. Do you want to exchange the goods? If you could get the goods fixed, would you be happy to accept that? If the answer's yes, life's easier. I've been told this was their last violin in stock. I will be asking for a refund... because they've already dumped a faulty instrument on me once. If I don't get a refund, I suppose I'll lodge a complaint with Consumer Affairs and / or name the store. They're ages away, so I'll be losing a chunk of my Monday. I'd just be happy with a full refund- they will almost definitely not pay anything more than that for transport or inconvenience, law notwithstanding. I called to ensure their technician would be in when I visited (so I wouldn't make the trip for nothing- they said they needed their technician to be available to make an assessment). I stated firmly I wanted a refund, but their response was that they checked the instrument at the time of purchase and that it was fine, and that I needed to actually bring it in to assess what I was talking about. They were reasonably civil this time around. That looks like a crack to me, just from the way the line goes around a corner, it would be super hard to make a scratch like that unless someone did it on purpose. Either way, scratch or crack I wouldn't be happy taking that as a brand new instrument. is there any way you could have it looked at independently. A luthier would be able to tell if the repairs had been done say before you purchased it. Then you would have an independent record stating it was indeed a crack. I really hope you can get your money back; it's such a shame when these kinds of thing happen. They didn't make eye contact, but they gave me my money back. I found an awesome restored violin at a luthier's later in the evening, which I bought. I love the sound. There seems to be a nick on the E-string, which I will call them about tomorrow, otherwise it feels like the instrument for me. A good ending to the day! Great news! E-strings can be easily (and inexpensively) replaced, so no worries there! Glad you're pleased with your purchase! Yup - I've just had a closer look at that ( I hadn't expanded the image before ) - it really now looks like a crack to me. Anyway - yah got yer money back - and a new/recon fiddle to boot from a reputable source - so it's all over - and the original shop will probably try to sell that turkey on to some other poor soul... Good result all round ! Yayyyyy ! Good for you on standing up for yourself. Glad it all worked out. Believe it or not, glue can be stronger than the actual wood but we would never do anything like that.